Although vintage costume jewelry is the focus of my life and work, I am also a fan of beautiful fine jewelry created in the 1920s through the 1950s, the decades I specialize in. (Fine jewelry is jewelry created with precious metals – such as gold or platinum – and precious gemstones – such as diamonds, emeralds, rubies and/or sapphires.) Because I recently got to see Sorry, Wrong Number on the big screen (a rare treat! ), I decided to write about the stunning jewelry Barbara Stanwyck wore in the film. The pieces were all designed by William Ruser. Before I talk about this talented and well-respected jewelry designer whose name is not well-known today, let me introduce you to the film. 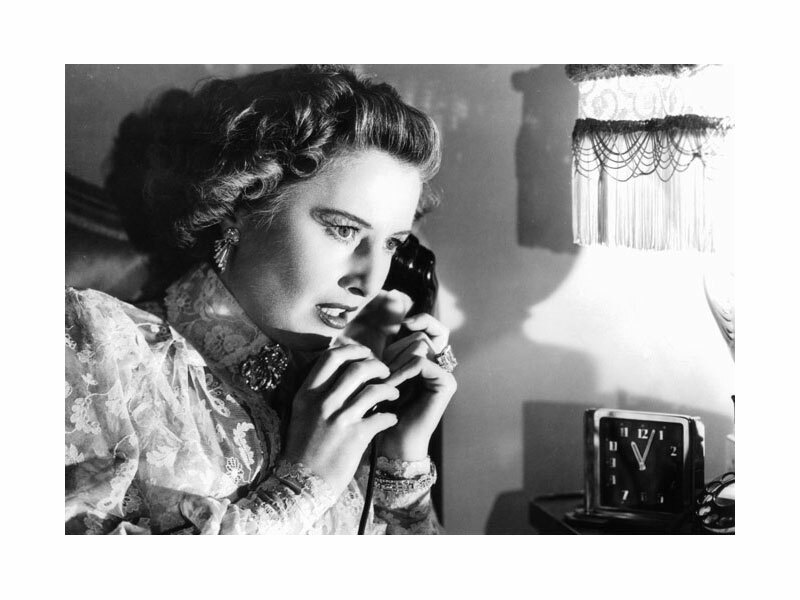 Directed by Anatole Litvak and released in 1948, Sorry, Wrong Number is a suspense thriller starring Barbara Stanwyck as self-centered, overbearing Chicago heiress Leona Stevenson. She is spending the summer in a luxury Manhattan apartment with her husband (played by Burt Lancaster), her nurse and several servants. Confined to her bed because of a psychosomatic heart condition, Leona is alone in the house when an attempted phone call to her husband instead connects her to a conversation between two men discussing a plan to murder an unnamed woman that evening. Over half of the film is set in her bedroom, with Leona trying to identify and warn the intended victim until she realizes that it is she. The events leading up to that night are told in a series of flashbacks. Stanwyck’s performance, which earned her an Oscar nomination, and the successful building of suspense until the inevitable climax are due, in part, to the fact that the bedroom scenes were filmed in one block, over a 12-day period, according to TCM’s Robert Osborne. The above film still shows one of the bedroom scenes. In all of them we see Stanwyck clad in what Jay Jorgensen describes in his book about Edith Head, the film’s costume designer, as “a tailored pink Chantilly lace nightgown and bed jacket”. Penny Proddow, Debra Healy and Marion Fasel, in Hollywood Jewels, comment further on Stanwyck’s bedroom attire: “Though totally alone and dressed in a negligee, she wears a full suite of diamond jewelry – an iris brooch, a wide bracelet, ribbon earrings, and rings”. You can get an idea of these jewels in this still, although they are not shown in great detail – except for the huge diamond ring! A larger version of the same photo is in Hollywood Jewels. One particular jewel in the film is shown in several photos in this book: Stanwyck’s own Ruser gardenia brooch. 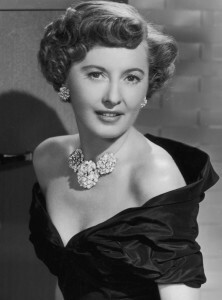 Described by the authors as “three-dimensional, layered circular-cut diamond petals and pistils”, this brooch was actually part of a trio, which Stanwyck wore as a necklace with the matching earrings in this 1955 portrait on the right. We see the larger, center brooch in two scenes in the film. The first time is at Stanwyck and Lancaster’s wedding, one of the flashback scenes. Jorgensen describes her wedding gown as “shimmering silver brocade with a veil of expensive material and a six-foot train. Five yards of materials were used to create the gown, and the cost ran into the thousands of dollars”. The accessories include the “gardenia brooch suspended from a round diamond and platinum link chain with matching earrings” (Hollywood Jewels). The book shows the couple’s wedding portrait (which we see on Leona’s bedside table) as well as another photo unrelated to this film. In the latter, Stanwyck wears all three gardenia brooches on a platinum and diamond chain, along with matching earrings and a ring with a rectangular-cut 9.37 carat diamond – all from her own collection. Born in Philadelphia in 1908, William Ruser began his career in the Atlantic City, New Jersey branch of the jewelry firm Trabert & Hoeffer-Mauboussin Jewelers (a collaboration of Trabert & Hoeffer, an American firm, with the Parisian house Mauboussin). By the 1930s, Ruser had moved to Beverly Hills, where he managed that branch of the firm. He served in the Army Air Corps in World War II and, in 1949, opened his own business – Ruser Jewels – at 300 Rodeo Drive with his wife, Pauline. According to Hollywood Jewels: “The firm was known for its curvaceous, three-dimensional platinum and diamond jewelry, with subtle gradations of form and structure”. In addition to this type of merchandise, Antique Jewelry University credits the Rusers for their cutting-edge use of baroque, freshwater pearls at a time when few of their competitors did: “In the vanguard, along with Verdura and Seaman Schepps, the Rusers created swans, hummingbirds, poodles, skunks as well as demonic looking cherubs with freshwater pearl accents”. Clients included other Hollywood elite such as Joan Crawford, Marlene Dietrich and Lana Turner, who wore Ruser creations both on and off screen. 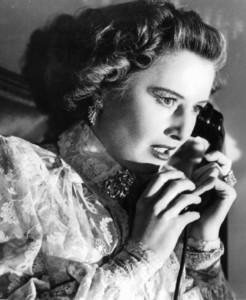 According to the TCM website, Sorry, Wrong Number is the earliest film for which Ruser received screen credit (which read “Miss Stanwyck’s Jewels by Ruser”). TCM also credits him for Joan Crawford’s jewels in Sudden Fear (1952) and for jewels in Career, starring Shirley MacLaine and Carolyn Jones (1955). Unfortunately, I have not seen either of these two films, so I cannot comment on the jewels in them. Ruser closed his business and retired in 1969, selling the location to Van Cleef & Arpels. He died in 1994. For more information on Ruser’s work, see Hollywood Jewels for photos of Stanwyck’s gardenia brooches (including close-ups of the front and back) and Crawford’s charm bracelets and poodle brooches. 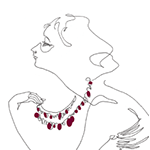 The Antique Jewelry University website shows several Ruser pieces as well as examples of his maker’s marks. You can see an amethyst suite (necklace, bracelet and earrings) by Ruser from the collection of Joan Crawford, which was displayed at Masterpiece London 2014, here. Be sure to scroll down to see a close-up of the necklace and bracelet. If you want to know more about Barbara Stanwyck’s life and extraordinary work, read Victoria Wilson’s A Life of Barbara Stanwyck: Steel – True, 1907 – 1940 (volume 1). And Sorry, Wrong Number is shown on TCM from time to time. I just recently watched Woody Allen’s “Hannah and Her Sisters” in which Diane Wiest is wearing gobs of vintage costume jewelry in every scene. You probably love Woody’s films as much as I do because they usually have Santo Loquasto’s set designs reminiscent of the period your jewels stem from. (Incidentally, he’s from Wilkes Barre, PA). Thanks for writing about “Sorry Wrong Number.” It’s been years since I’ve seen it. Time to take a fresh look at those bijoux. I haven’t seen “Hannah and Her Sisters” in ages, and I never noticed Diane Wiest’s jewelry! How’s that possible? I’m going to see the movie again asap. I’ll also pay attention to the set designers. I did love Woody’s “Midnight in Paris”! Thanks for your comments. I hope you get to see “Sorry” on the big screen. Aside from the fabulous jewels in more detail, you’ll also notice how excellent the cinematography was.